Bryce Harper of the Washington Nationals and Hunter Strickland of the San Francisco Giants throw punches at one another after Strickland hit Harper with a pitch in the top of the eighth inning at AT&T Park on May 29, 2017, in San Francisco, California. Drilled in the hip by a heater, Bryce Harper knew where this was headed and in a hurry, too. "You see red," he said. Enraged, the Washington slugger charged the mound, fired his helmet and traded punches to the head with reliever Hunter Strickland, setting off a wild brawl Monday during the Nationals' 3-0 win over the San Francisco Giants. "You never want to get suspended or anything like, but sometimes, you just got to go and get them and can't hesitate," Harper said. "You either go to first base, or you go after him, and I decided to go after him." The two players have a history between them stemming from the 2014 playoffs. This flashpoint came in the eighth inning. With two outs, none on and Washington ahead 2-0, Strickland hit Harper with the first pitch, a 98 mph fastball. Harper didn't wait. The four-time All-Star pointed his bat at Strickland, yelled at him and took off. "My head was on a swivel, as quick as I could to not get taken out by somebody on their team or anything like that," he said. No one got in Harper's way as he rushed the mound. His eyes were wide as he flung his helmet -- it wasn't close to Strickland, and it might've slipped -- and they started swinging away. Strickland hit Harper in the face, then they broke apart for a moment before squaring off again. Harper punched Strickland in the head as the benches and bullpen emptied. "I was trying to go after him, with the helmet or with myself, just doing what I needed to do keep it going, I guess," Harper said. Giants teammates Michael Morse and Jeff Samardzija collided hard as they tried to get between the two fighters. Three Giants players forcefully dragged Strickland from the middle of the pack all the way into the dugout, while a teammate held back Harper. Harper and Strickland were both ejected. No injuries were reported in either clubhouse. Harper attributes a scratch to Nationals third baseman Anthony Rendon pulling him away from the brawl. In the 2014 NL Division Series, Harper hit two home runs off Strickland. Harper watched the second shot sail down the line, in Game 4, and glared at the reliever as he rounded the bases. This was the first time they'd faced each other since then. 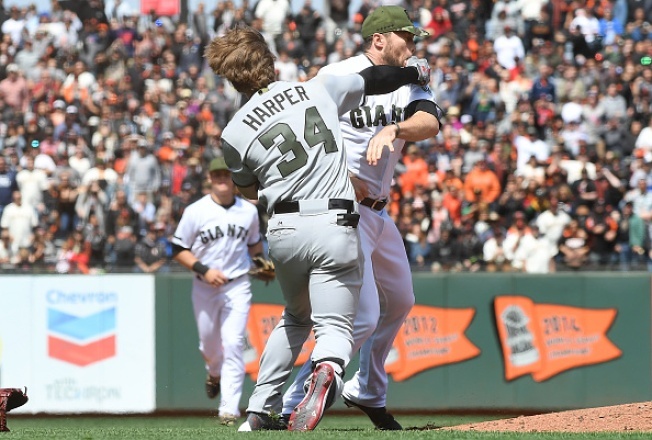 "I wasn't sure what was going on, but I think (the Giants) were definitely shocked at the situation, shocked that he would so something like that three years later," Harper said. Strickland said he missed his spot. "I left the ball over the plate a couple of times to him," he said. "He's taken advantage of that, so I went inside. Obviously, I got in a little too far." Giants manager Bruce Bochy framed it for everyone. "It looks bad, it does," Bochy said. "Harper gets hit and you look at a guy who's given up some home runs, and he'll tell you that he was trying to come in. You don't want to make a mistake there. You have two guys who don't care for each other too much. It was a pretty good pile." Nationals manager Dusty Baker had no doubt about Strickland's intent. "We were ahead 2-0, two outs and nobody on base. I mean, that's the prime time to hit somebody if you're going to hit them, it looked like it was intentional to me," he said. "What's a man supposed to do? He's not a punching bag, he's human with emotions. I know he took (Strickland) deep in the playoffs a couple of times and he probably took exception to that. I mean baseball is a game where you don't forget and you can hold grudges for a long, long time." Too long in the estimation of Harper and his teammates. "Completely uncalled for," Nationals second baseman Daniel Murphy said. "Bryce hits one ... off him in a big spot from what I understand, I think I remember seeing it live, and Hunter waits three years. I think if the Giants thought it was that egregious, Bryce would've gotten one the next season." Nationals outfielder Jayson Werth, Harper's teammate in 2014, said the incident shouldn't come as that big a surprise. "You can't assume what other people are thinking or what other people are going to do," he said. "History is history, some people hold it longer than others."